The train had been stuck near the tiny town of Oakridge since Sunday evening. An Amtrak train with 183 passengers aboard was stranded in Oregon for over 24 hours. The Coast Starlight Train 11, traveling from Seattle to Los Angeles, came to a standstill near the tiny town of Oakridge on Sunday evening after hitting a tree that had fallen on the snow-covered tracks, according to Amtrak spokesman Marc Magliari. No passengers or crew members aboard were injured but "conditions further deteriorated with numerous track blockages from snow and fallen trees," Magliari told ABC News in a statement early Tuesday morning. 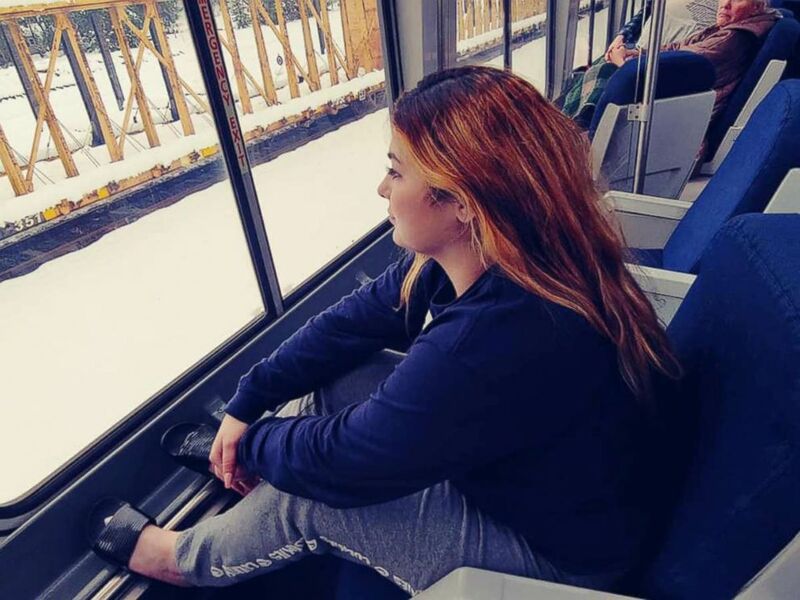 "Due to worsening conditions, area road closures and no viable way to safely transport passengers or crews via alternate transportation, Train 11 stopped in Oakridge, Oregon," Magliari added. "We are actively working with Union Pacific to clear the right of way and get passengers off the train." Amtrak executive vice president and chief operating officer Scot Naparstek said there was more than a foot of heavy snow and numerous downed trees blocking the track. "With local power outages and blocked roads, it was decided the safest place for our customers was to remain on the train where we were able to provide food, heat, electricity and toilets," Naparstek told ABC News in a statement Tuesday morning. (Courtesy Rebekah Dodson) Passengers aboard a stranded Amtrak train near Oakridge, Ore., Feb. 25, 2019. 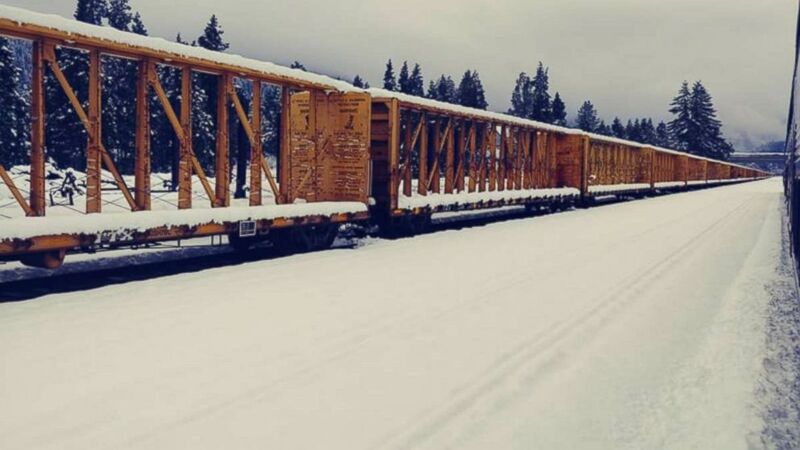 Amtrak worked with crews from Union Pacific Railroad, which operates more than 32,100 miles of tracks in 23 western U.S. states, to open a route to the stranded train and clear the track Tuesday morning. Union Pacific Railroad spokesman Tim McMahan said the Amtrak train was "inoperable" due to poor weather conditions and fallen trees. "Amtrak has made the decision to keep the passengers on the train because power is out in the city [of Oakridge]," McMahan told ABC News in a statement early Tuesday morning. "Also, with only two small hotels in town they don’t want to separate the passengers prior to having them reboard for departure." By 8 a.m. local time, a locomotive was pulling the southbound train back north toward Eugene, Oregon, so it could return to Seattle, its origin. "We will be contacting customers to provide refunds and other compensation as appropriate," Naparstek said. Amtrak said via Twitter that passengers aboard the stranded train were not charged for food or water. One of the passengers, Rebekah Dodson, said the train had power and heat and meals were being provided. But food was running out as they waited for help and there was no other supplies available. The snow outside was too deep for them to step off the train to get some fresh air, she said. "People are restless but in good spirits," Dodson told ABC News via Facebook. Another passenger, Carly Bigby, said mothers with young children aboard the train were forced to create makeshift diapers and were in need of baby formula. "They don't have those supplies on the train," Bigby told ABC News. "So we're kind of just making do with what we have."